The songs you know – performed with high energy. If you have ever listened to modern rock radio, you likely know several of Puddle of Mudd’s tunes; Blurry, She Hates Me, Drift and Die, the list is pretty extensive. Although the band has had several line-up changes through the years – they did what mattered – preformed those songs that we all know and love – and performed them well. I studied up on the band a little before the show – but not everything seems to be current information on the interwebs. Puddle of Mudd is currently five members strong, including singer Wes and long-standing guitarist John. I was surprised that even though the band currently has two guitar players, Wes spent a nice chunk of the show with a guitar. Comparing the show I saw with some past shows – I have a guess. I think that Wes is slowly turning over guitar duties to the other members, and is wanting to shine as the un-tethered front man. Because, let’s face it, while I completely respect when someone is able to play instruments, but as a front man being tied down to guitar duties limits what he can do on stage. All the members of the band seemed really into the show, taking time to connect with the audience as much as possible, and continually throwing guitar picks out to the crowd. Several points Wes was the fearless front man, straddling the barricade to reach further into the crowd. From song to song – there was a lot of singing along – which was thoroughly encouraged by Puddle of Mudd. Wes’s voice sounded strong, although he appeared to be battling a cold. Definitely merits the title of “rock star” when they don’t seem to be feeling well and still put on a crazy fun show. There were some minor technical issues that took a little steam out of one of the songs near the beginning – ear pieces and wires seemed to be the thorn in the guys’ side for the night. They handled the issues well, like the road-tested band they are. It was interesting the watch the band member’s interactions with one another. As an outsider, who hasn’t really followed the band I can only assume that the melding process is still happening. The new members are just starting to gel together as a cohesive unit – a cohesive stage presence. 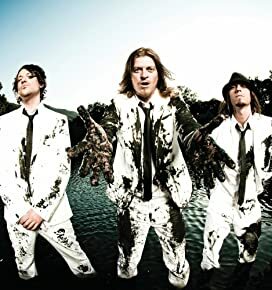 Love the little bit of Black Sabbath slipped in, and the AC/DC cover – nice additions to a string of hits from Puddle of Mudd. The biggest surprise goes to the drummer – who played this outrageous drum solo – a great highlight for the night. I really enjoyed the show, but I have to mention one little issue. I’m not sure if the trouble with the cords are to blame, if the stage felt a little cramped for the band…. But Wes barely made it to the right side of the stage. How am sure of that? Well that was the side I was on. I know that people have patterns, and maybe this is an unconscious habit – but Wes worked the hell out of the left side of the stage — leaving us on the right side feeling a little left out. So if you plan on seeing Puddle of Mudd and are a big Wes fan – the left side might be a better bet. Thanks to Puddle of Mudd for making the trek all the way to Panama City — we hope ya’ll had fun, because we sure had fun with you! This entry was posted on May 26, 2011 by 850music in Posts and tagged review.